Since it is important to transfer the minerals desired by plants for a long time in a controlled manner, simple and economical new micro and macro scale agricultural production systems are needed. In this study, the nutrients in the plant nutrient solution were kept at the required level according to the needs of the plant, using computer controlled potentiometric micro-sized chemical sensor systems. Polyvinylchloride (PVC) -based ion-selective sensors have been used to sensitively and selectively measure the concentration of macro nutrient NO3 −, K+ , and Ca2+ ions in the hydroponic solution. It has been found that the nitrate, potassium and calcium ion levels required for the green pepper and eggplants grown in the greenhouse are different. The results showed that in the first two months of growth, the pepper consumed nitrate in a lesser amount than the eggplant. In addition, it was determined that the amount of potassium consumed by plants was higher than that of other nutrients. Bitkilerin arzuladığı minerallerin uzun süre kontrollü bir şekilde bitkiye aktarılması önem arz ettiğinden, basit ve ekonomik yeni mikro ve makro ölçekli tarım üretim sistemlerine ihtiyaç duyulmaktadır. Bu çalışmada, beslenme sürecinde bitki besin solüsyonu içindeki besin elementlerinin bitkinin ihtiyacına göre istenen düzeyde tutulması, bilgisayar kontrollü potansiyometrik mikro büyüklükte kimyasal sensör sistemler kullanılarak takip edilmiştir. Hidrofonik çözeltideki makro besin elementlerinden NO3−, K+ ve Ca2+ iyonlarının derişimini hassas ve seçici olarak ölçmek için polivinilklorür (PVC) temelli iyon-seçici sensörler kullanılmıştır. Serada yetiştirilen yeşilbiber ve patlıcan fidelerinin ihtiyacı olan nitrat, potasyum ve kalsiyum iyon seviyelerinin farklı olduğu görülmüştür. Elde edilen sonuçlar, büyümenin ilk iki ayında, biber bitkisinin patlıcandan daha az miktarda nitrat tükettiğini göstermiştir. Ayrıca, bitkilerin tükettiği potasyum miktarının tayin edilen diğer besin elementlerinden daha fazla olduğu belirlenmiştir. Anonim, 2016. Topraksız Tarım. http://www.bahce bitkileri.org/topraksiz-tarim-sunumu.html (Erişim tarihi: 02.10.2016). Bailey, B.J., Haggett, B.G.D., Hunter, A., Albery, W.J., Svanberg, L.R., 1988. Monitoring nutrient film solutions using ion-selective electrodes. Journal of Agricultural Engineering Research, 40(2): 129-142. Benoit, F., Ceustermans, N., 1995. Horticultural aspects of ecological soilless growing methods. Acta Horticulturae, 396: 11-24. Blok, C., Kreij, C.D., Baas, R., Wever, G., 2008. Analytical methods used in soilless cultivation. In: M. Raviv and JH. Lieth (Ed), Soilless Culture: Theory and Practice, Amsterdam, pp. 245-289. Cloutier, G.R., Dixon, M.A., Arnold, K.E., 1997. Evaluation of sensor Technologies for automated control of nutrient solutions in life support systems using higher plants. In: Proceedings of the 6th European Symposium on Space Environmental Control Systems, Noordwijk, The Netherlands. Çoldur, F., Andaç, M., Işıldak, İ., Saka, T., 2009. A micro-sized PVC membrane Li+-selective electrode without internal filling solution and its medical applications. Journal of Electroanalytical Chemistry, 626(1): 30-35. Gierth, M., Mäser, P., 2007. Potassium transporters in plants - Involvement in K+ acquisition, redistribution and homeostasis. FEBS Letters, 581(12): 2348-2356. Gutierrez, M., Alegret, S., Caceres, R., Casadesus, J., Marfa, O., Del Valle, M., 2007. Application of a potentiometric electronic tongue to fertigation strategy in greenhouse cultivation. Computers and Electronics in Agriculture, 57(1): 12-22. Işıldak, İ., Yolcu, M., Işıldak, Ö., Demirel, N., Topal, G., Hoşgören, H., 2004. All-solid-state PVC membrane Ag+-selective electrodes based on diaza-18-crown-6 compounds. Microchimica Acta, 144(1): 177-181. Jones, J.B., 2005. Hydroponics: A Practical Guide for the Soilless Grower. 2nd ed. CRC Press, Boca Raton, FL. Kaplan, M., Sönmez, S., Tokmak, S., 1999. Antalya-Kumluca yöresi kuyu sularının nitrat içerikleri. 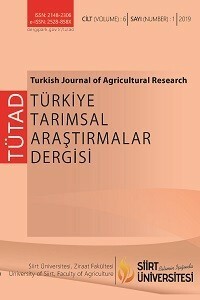 Turkish Journal of Agriculture and Forestry, 23: 309-313. Meriç, M.K., Tüzel, İ.H., Tüzel, Y., Öztekin, G.B., 2011. Effects of nutrition systems and irrigation programs on tomato plants in soilless culture. Agricultural Water Management, 99(1): 19-25. Nieves-Cordones, M., Aleman, F., Martinez, V., Rubio, F., 2014. K+ uptake in plant roots. The systems involved, their regulation and parallels in other organisms. Journal of Plant Physiology, 171(9): 688-695. Pardossi, A., Tognoni, F., Incrocci, L., 2004. Mediterranean greenhouse technology. The World of Horticulture, 44: 28-34. Raviv, M., Lieth, J.H., 2008. Soilless Culture: Theory and Practise. Elsevier, Amsterdam, The Netherlands, p. 343-424. Savvas, D., 2002. SW-Soil and water: Automated replenishment of recycled greenhouse effluents with individual nutrients in hydroponics by means of two alternative models. Biosystems Engineering, 83(2): 225-236. Sönmez, İ., Kaplan, M., 2004. Demre yöresi seralarında toprak ve sulama sularının tuz içeriğinin belirlenmesi. Akdeniz Üniversitesi Ziraat Fakültesi Dergisi, 17(2): 155-160. Van Os, E.A., Gieling, T.H., Ruijs, M.N.A., 2002. Equipment for hydroponic installations. In: D. Savvas and H. Passam, HC (Eds), Hydroponic Production of Vegetables and Ornamentals, Embryo Publications, Athens, Greece, pp. 103-141. Vardar, G., Altıkatoğlu, M., Onat, D., Cemek, M, Işıldak, İ., 2015. Calcium, potassium and nitrate in plant nutrient solutions by measuring of with ion-selective electrodes in hydroponic green house of some vegetables. Biotechnology and Applied Biochemistry, 62(5): 663-668.